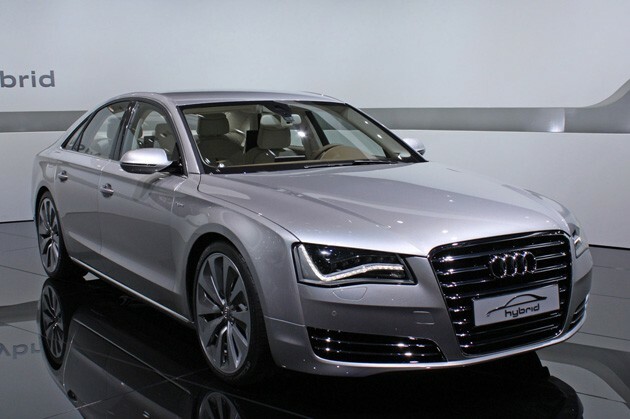 Scheduled to launch in 2012, the Audi A8 hybrid combines the best of two worlds. Its gasoline engine – a 2.0 TFSI – and an electric motor develop peak output of 180 kW (245 hp) and 480 Nm (345.03 lb-ft) of torque for short periods of time. The luxury sedan can travel up to a speed of 100 km/h (62.14 mph) on electric power alone, and covers around three kilometers (1.86 miles) with zero local emissions at a speed of 60 km/h (37.28 mph). In the standard test cycle, it consumes less than 6.4 liters per 100 km (36.75 US mpg), which corresponds to CO2 emissions of less than 148 grams per km (238.18 g/mile). Please note that these are provisional figures. Directly mounted behind one another, the 2.0 TFSI and the electric motor of the Audi A8 hybrid form a parallel hybrid system. The sedan accelerates to 100 km/h (62.14 mph) in 7.7 seconds from a standing start and has a top speed of 235 km/h (146.02 mph). The 2.0 TFSI has a displacement of 1,984 cc and an output of 155 kW (211 hp), with a maximum torque of 350 Nm (258.15 lb-ft) at 1,500 to 4,200 rpm. In the typical Audi manner, the four-cylinder engine combines three potent efficiency technologies: FSI gasoline direct injection, turbocharging and the Audi valvelift system. The latter of these further increases power, torque and efficiency by switching the stroke of the exhaust valves between two stages depending on the load and engine speed. For use in the Audi A8 hybrid, the 2.0 TFSI underwent modifications in several areas. The alternator as an ancillary unit has been dropped, while the crankshaft bearing and the fine tuning of the turbocharger were adapted to the new requirements. A secondary air system at the cylinder head makes sure that the exhaust gas treatment cuts in particularly fast. Integrated in the engine control unit, the hybrid manager controls the efficient change and smooth transitions between the operating modes. An extensively modified eight-speed tiptronic serves the power transmission, without the aid of a torque converter. Its place is taken by the disk-shaped electric motor. The permanent magnet synchronous motor (PSM), which also functions as a starter and – during deceleration – as a generator, has a peak output of up to 40 kW (54 hp) and 210 Nm (154.89 lb-ft) of torque for short periods of time. The electric motor is integrated in the cooling circuit of the TFSI engine. The motor is combined with a multi-plate clutch operating in the oil bath and joining or separating it and the TFSI. Controlled by intelligent management, the clutch operates ultra-precisely, gently and fast in all situations. The highly comfortable and fast-shifting hybrid transmission, which guides the engine torque to the front wheels, greatly contributes to the efficiency of the Audi A8 hybrid – its gears are widely spread. When the 2.0 TFSI is deactivated, an electric pump maintains the oil pressure in the hydraulic system to safeguard the convenient start-stop feature. The power electronics, in the form of a pulse-controlled inverter, serve as a controller between the battery, which outputs direct current, and the electric motor, which operates on alternating current. Water-cooled by a separate low-temperature circuit, the component is distinguished by its low volume and weight. The power electronics include a DC/DC converter that couples the consumers in the 12V electrical system with the high-voltage network. A lithium-ion battery system, weighing a mere 36.7 kg (80.91 lb), serves as the energy store for the electric motor of the Audi A8 hybrid. The compact battery with a volume of just 26 liters (0.92 cu ft) is located in an area beneath the luggage compartment that is protected in the event of a collision. The trunk capacity is 335 liters (11.83 cu ft). The battery consists of 72 cells; at 266 volts its nominal energy is 1.3 kWh and its power up to 40 kW. The lithium-ion battery is cooled by air in two ways, depending on the requirement. At low-temperature load, it draws temperate air from the vehicle interior by way of a fan. If its temperature exceeds a certain limit, a separate refrigerant circuit is activated. It is coupled to the automatic air conditioning system of the Audi A8 hybrid and uses a separate evaporator. This powerful active cooling system greatly helps the sedan to travel relatively long distances on electric power alone. 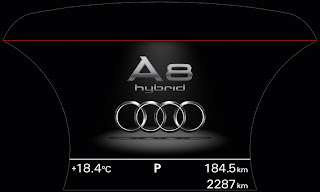 The driver can decide which operating mode the Audi A8 hybrid should use – one of three driving modes can be selected at the press of a button on the center console or by means of the automatic selector lever. The EV characteristic map gives priority to the electric drive, while the D mode efficiently controls both the engine and the electric motor. The S mode and the tiptronic gate are designed for a sporty driving style. The hybrid sedan can operate in one of five drive modes: Driving with the combustion engine alone, with the electric drive alone or in hybrid mode is possible, as are recuperation and boosting. Both drive sources are deactivated when the vehicle is stationary. In this convenient start/stop mode the automatic air conditioning remains active – its compressor has an electric drive. Once the driver releases the brake, the A8 hybrid starts rolling. It can be driven up to 100 km/h (62.14 mph) under electric power – and therefore with no local emissions. At a constant 60 km/h (37.28 mph) up to three kilometers (1.86 miles) can be traveled – enough for many residential areas and inner cities. When the driver presses the accelerator beyond a certain threshold, the internal combustion engine takes over the drive function. At lower revs this engine will temporarily have a heavier load than is required for the drive – the load point shifts to a higher range and the efficiency improves. The excess torque benefits the electric motor, which then serves as a generator to recharge the battery and power the consumers. In quick acceleration, or “boosting,” the electric motor operates together with the TFSI; at full throttle in the S mode or during kickdown the full system output is briefly available. The hybrid drive then supplies the propulsion power of a large, naturally aspirated engine, but with far more efficiency. When the driver releases the accelerator, the electric motor serves as a generator again. In most situations the TFSI is then decoupled from the drive system, so as not to cause any drag losses. The electricity recovered by the electric motor when coasting and during braking is buffered in the lithium-ion battery. If the driver only brakes slightly, the electric motor performs the deceleration itself; during more forceful braking, the hydraulic braking system is simultaneously activated. Its brake booster has a second power supply through an electric vacuum pump. A complex rule-based strategy adapts the braking to the conditions of electric driving and energy recuperation. The power steering uses an electromechanical system. 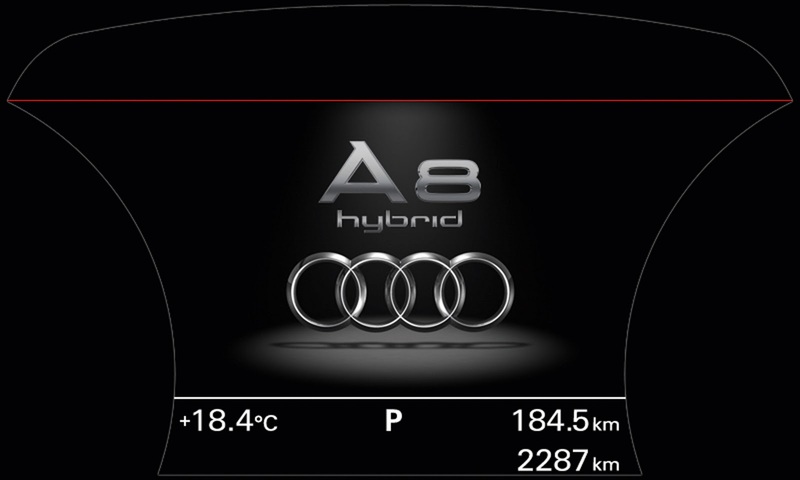 The Audi A8 hybrid comes with a display concept for making the driving states of the hybrid drive tangible to the driver. The tachometer on the instrument cluster has been replaced by a power meter, with a needle that indicates the total system output on a scale of 0 to 100 percent. A second scale is divided into colored segments – the gray and orange sections clearly indicate the drive mode currently used by the sedan. An additional instrument displays the charge level of the lithium-ion battery. At the same time, the energy flow display clearly depicts the mode of operation and active components of the hybrid drive. It can be called up via the driver information system and the central MMI display. The MMI monitor shows a bar graph of the average consumption and recuperation quantity in five-minute increments. Although room has to be made for all of the hybrid technology, the A8 hybrid is not a Spartan model. It comes standard with particularly efficient LED headlights, the Bose sound system, three-zone automatic air conditioning and a metallic paint finish. The 18-inch cast wheels of the Audi A8 hybrid feature a ten-arm turbine design – their ten spokes resemble turbine blades. The tires have the size 235/55 R18. As an option, there are 19-inch wheels with a two-color paint finish and in the same design, which is typical for hybrid vehicles from Audi, with 245/45-series R19 tires. Beyond that, the Audi A8 hybrid is further distinguished by the subtle differentiation on the outside. The rear hatch and the fenders bear hybrid badges; these are illuminated in door sill trims. Arctic Silver is available as an exclusive paint finish. The A8 hybrid will be one of the lightest vehicles in its competitive segment, drawing on Audi’s comprehensive ultra-lightweight competence. Except for the B-pillars of hot-shaped, ultra-high-strength steel, its ASF (Audi Space Frame) body is made entirely of aluminum. Weighing just 231 kilograms (509.27 lb), it is roughly 40 percent lighter than a comparable steel construction. The ASF body is structured according to bionic principles. Its frame comprises extruded sections and pressure diecast parts of aluminum; the aluminum panels – such as the roof panels and the side panels – are joined by friction connections. Like the bones of a human skeleton, all components combine optimal function with low weight. The material is used only where necessary and always in a tailored configuration.